June 27, 2018, 3:48 p.m.
Contestants: Red Bull, Nike, Old Spice, Proctor & Gamble, Aldi, ALS, and Lego. Aldi emerges as the clear winner for the Tennies (Tennies? Teenies? Twenty-tens? A question for another poll, perhaps…). It features the grandma many of us wish we had giving a personal finance tip with a little extra: Aldi’s got the cheaper tea, but you should probably go for gin. 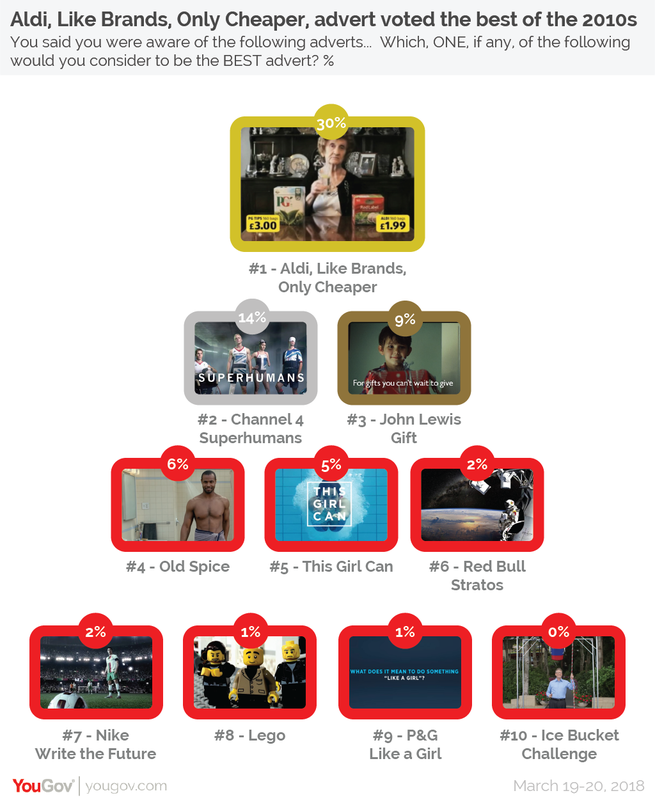 Three in ten (30%) who recognise ads from the decade select it as the best. 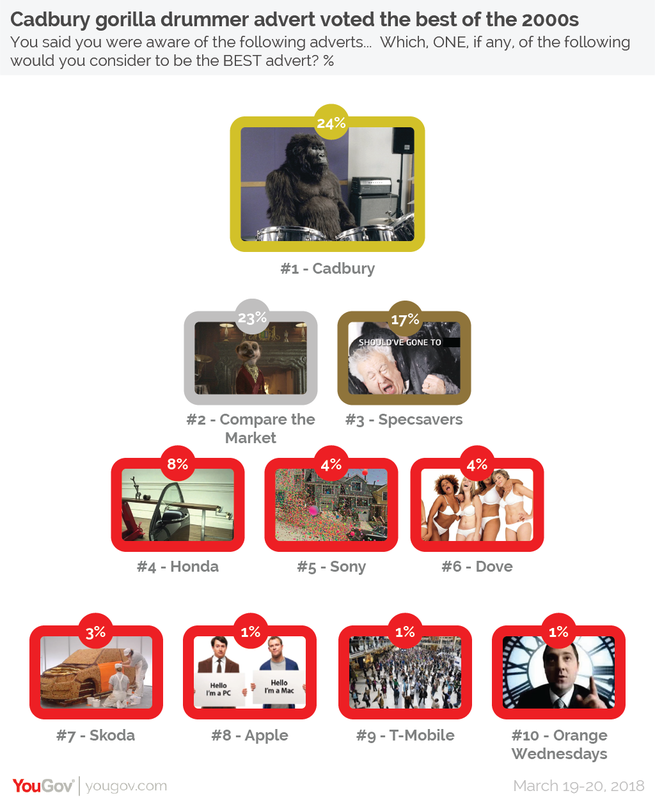 Superhumans, a Channel 4 advertisement for the Paralympics, takes second place (14%), followed by John Lewis’s Gift ad (9%). Old Spice (6%) wins the battle for fourth place over Nike’s This Girl Can (5%). Old Spice’s ad was chosen by more men than women while the opposite was true of Nike’s. Contestants: Cadbury’s, Honda, Apple, Sony, T-Mobile, Compare the Market, Dove, Skoda, Orange, and Specsavers. Animal ads did well in the noughties. Cadbury’s drumming gorilla and Compare the Market’s meerkats are neck to neck (picture that for a moment) for best advert, with 24% and 23% respectively. The gorilla wins strong support from younger people, being chosen by over a third of 18-24s (35%) and 35-44s (34%). However, only one in seven (14%) aged 55+ pick it as the best ad. By comparison, the meerkats are more loved by older generations. Around three in ten (29%) of 55+ respondents have it as their best ad, compared to just one in five 35-44s (19%) and 18-24s (21%). However, Compare the Market’s ad has the largest audience by far. Nine in ten (91%) respondents recognise it (even if 4% assume it is an ad for, well, meerkats). By contrast, Cadbury’s drumming gorilla is only recalled by six in ten (61%), with older generations being particularly unlikely to recognise it (only 51% of the 55+ age group correctly identified the brand, compared to 93% of 18-24 year-olds). On the other hand, the Specsavers ad where the elderly couple intending to sit on a nice bench to enjoy a lunchtime sandwich and accidentally getting on a rollercoaster instead (‘should’ve gone to Specsavers’) unites us all. Eight in ten (82%) have seen the advert and the brand is correctly identified by 97% of them – with no more than 2 percentage point variation among ages and genders when it comes to both seeing and recognising the ad. Contestants: Tango, Guinness, Wonderbra, Budweiser, Reebok, BT, Boddingtons, Tesco, Silk Cut, and Calvin Klein. Guinness’ Surfer campaign was the most seen and most recognised ad of the decade. The black-and-white two-minute drama shows a surfer’s long, steady wait for the perfect ‘white horse’ wave pays off (just as waiting for the perfect Guinness would. A quarter (25%) of ad viewers say it is the best of the 1990s, with men being more likely than women to recognise the advert (63% vs 50%). Tango comes second (15%), with the most enthusiasm coming from those aged 45-54 – 25% of whom selected it as the best. Wonderbra comes third (8%), with men being more likely than women to choose it. Contestants: Levis, Apple, Nescafe, OXO, Nike, British Gas, AIDS, Yellow Pages, Benetton, and the Economist. 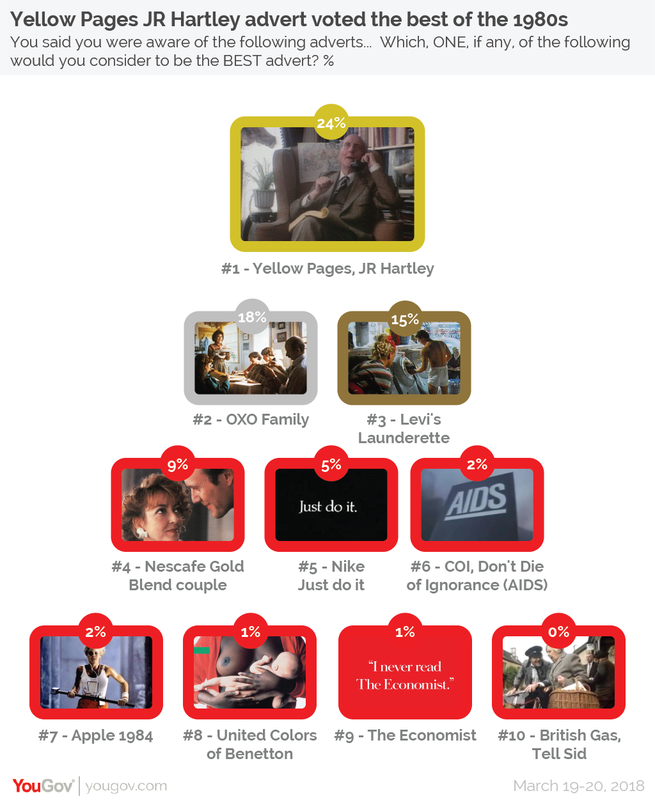 The Yellow Pages JR Hartley advert is the one rated as the best by the public (24%). It featured an elderly gentleman traipsing from bookshop to bookshop in search of his book “Fly Fishing: Memories of Angling Days” and ends up with tracking it down from the comfort of his home by calling every publisher in the Yellow Pages. The ad did so well that someone actually published the book. The OXO family ad featuring Lynda Bellingham is second (18% - true fans will recognise it as the ‘Remember Preston’ episode). However, popular though it was, only 51% of those who had seen the ad recognised it as OXO – 43% thought it was for Bisto instead. Contestants: Cinzano, Carlsberg, Heineken, Coke, Hovis, Cadbury’s Finger of Fudge’, R Whites Lemonade, Green Cross Code Man, Smash, and the Conservatives ‘Labour Isn’t Working’ poster. Hovis’s bike ad is the favourite one from the decade (28%) – it has particularly strong support among the under 35s, with 23% of 18-24 year-olds and 31% of those aged 24-34 picking it as the best. The ad was so popular that Carl Barlow, who played the little boy, was invited back in 2013 to push his bike up the same cobbled hill in Shaftesbury and turn on the town’s Christmas lights. The Smash Martians – aliens who laugh at how much time and effort humans spend cooking potatoes (“they peel them with their knives, they boil them for 20 of their minutes”) – come a close second (26%). Cinzano is in third place (12%) with those aged 55+ (20%) being particularly likely to pick it as the best. *Ten advertisements were chosen for each decade by a group of senior industry professionals convened by Marketing Week. All panellists took five separate surveys, one for each decade. Panellists were shown one still image from each advertisement and asked whether they had seen it before, and if so, whether they could identify the brand it was for (this was an open-ended question). Any identifiable branding or logos were blurred out of the image.